Have you ever been to a restaurant and had a dish so delicious, that you could not wait to get back home and attempt to cook your version of it yourself? Well, that was just one my experiences recent upon a visit to one of my favorite cit ies in whole wide world…….New Orleans. 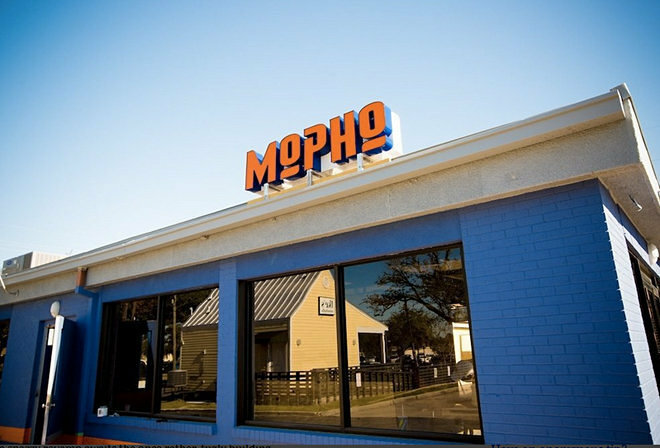 The restaurant was, “MoPho’s” , which is a little slice of heaven where the soul Vietnamese cuisine meets the melange of food that is the heart of Louisiana, is located in Mid-City at 514 City Park Avenue.Everything on the menu is great and affordable. Trust me,you will love it! If you ever spent any time in the Crescent City, then “you know what it means, to miss New Orleans”……the people, the music, and the food…..sigh, but I digress. Between Spring and Summer, I just cannot get enough of fresh seafood. And MoPhos’s Pepper Jelly Clams by Chef Michael Gulotta fits the bill. This dish is the epitome of the meeting of two cultures: Southeast Asia and the American South. Besides sharing a similar climate, Southeast Asian countries and New Orleans also have river deltas where brackish water flows into clean clear waters, that sweet spot where you can find some of the best seafood during a given season. Chef Gulotta uses little neck clams from Cedar Key Florida, but the stars of this dish are the Thai inspired ingredients, that make it spectacular. Adapted from Executive Chef-Partner Michael Gulotta of MoPho Restaurant. In a large braising pan set over medium-high heat, lightly toast the ginger, garlic, shallot, and Thai chili paste in the coconut oil. When the aromatics become golden brown, add in the rinsed clams followed by the white wine, mirin, and lemongrass stalk. Cover the pan and let the clams simmer until they open, about seven minutes. Once the clams open, remove the cover and add in the coconut milk, butter, and one cup of the pepper jelly. Simmer the clams for an additional minute and then add the lime juice, zest, and torn mint leaves. Season with salt to taste. 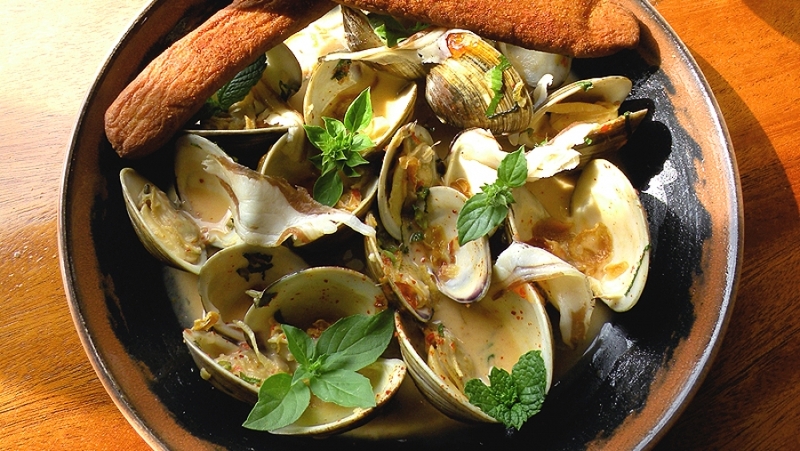 To serve, remove the lemongrass stalk and portion the clams into six warmed bowls and garnish with fresh mint leaves, shaved prosciutto, and a few dollops of the remaining pepper jelly.